Ever reached out for one of those seemingly ubiquitous energy drinks? There are dozens of them out there, and they seem to have become a staple especially with college students and clubbers. Sales of Energy Drinks skyrocketed to $9.7 Billion in the United States this year according to Symphony IRI data compiled by Bloomberg. Children and adults under 25 years provide most of that revenue. But consider this: in addition to the empty calories (some with over 50g of sugar! ), many of them have caffeine and stimulant ingredients such as guarana, glucoronolactone and L- phenylalanine at dangerously high levels– often time combined in one product. The FDA has warned parents and consumers against one such ingredient –DMAA (Dimethylamylamine), an amphetamine found illegally in some such products and often touted as ‘natural’ stimulant. It can be listed on the label as geranium extract and can elevate blood pressure; lead to shortness of breadth and even cause cardiac arrest or death – particularly when combined with caffeine or alcohol. Often times such products are offered in large cans…and since you cannot reclose these cans, our teenagers and young adults are consuming all of it exposing them to serious risk. According to the Substance Abuse and Mental Health Services Administration over 20,000 emergency room visits in 2011 were attributed to the consumption of dangerous energy drinks. Despite their obvious risks, it is alarming to note that the sales of energy drinks are being fuelled by an ever-increasing craving for energy by Americans, and our global counterparts alike. Our bodies’ need for energy is fundamental to our existence but we have also been engineered to meet this basic need by generating energy in our cells everyday. Our modern diet, devoid of cell energizing nutrients has impaired this basic function. So – what can we do? How can you get a safe pick-me-up everyday that helps your body adapt to this ongoing need for energy? NeoLife Tea mixes instantly in hot or cold water and is delicious! – delicately flavored with lemon and a golden drop of honey. With only 5 calories per serving and no artificial colors, flavors, sweeteners, or preservatives added – it’s not a surprise that this new NeoLife product is becoming the favorite of all. The next time you need a little boost, try NeoLifeTea. You’ll experience a natural energy lift while feeling calm and focused—and that’s something we all could use. I want to get this tea. Is it possible to get it with my order? Hi Egle. Thank you for your interest in NeoLifeTea! Your question regarding the Northern Europe market can be best answered by Distributor Services in Lithuania at +372-6 304 600. 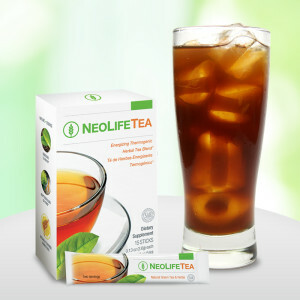 You can find more information on NeoLifeTea at NeoLife.com.